Includes a list of menu terms in Ukrainian and English. 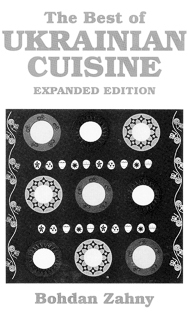 This compendium of Ukrainian cookery contains more than two hundred authentic Ukrainian recipes with the special touch, that until now, only a Ukrainian grandmother could provide. The Best of Ukrainian Cuisine offers recipes for Ukrainian favorites, such as kasha (buckwheat groats), potato pancakes, borsch, and stuffed cabbage along with popular contemporary dishes like pike sauteed in sour cream and apple babka.